Huatulco is best known as one of Mexico’s leading tourist resorts, one of several similar large-scale, purpose-built developments partially funded by federal funds. In 1967, responding to bullish predictions of US demand for beach vacations, Mexico’s central bank identified the five best places for completely new, purpose-built tourist resorts. Top of the list, as part of a 30-year plan, was the uninhabited barrier island now known as Cancún (see The growth of Cancún, Mexico leading tourist resort). The other choice locations were Ixtapa, Los Cabos, Loreto and Huatulco. The National Fund for Tourism Infrastructure (renamed the National Tourism Development Fund, Fonatur, in 1974) began building Cancún in 1970 and Ixtapa in 1971. Huatulco’s site on the coast of Oaxaca had been initially identified in 1969 but the area lacked adequate transportation infrastructure until the regional highways were improved in 1982. 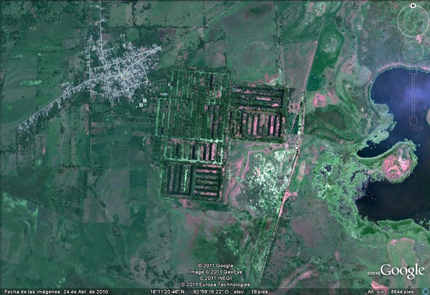 Legal land expropriations followed; by 1984 Fonatur controlled more than 21,000 hectares (50,000 acres). In 1985 Fonatur began construction of an airport and a service town, La Crucecita, a few kilometers back from the coast. In 1986 the villagers of the coastal community of Santa Cruz were resettled in La Crucecita. 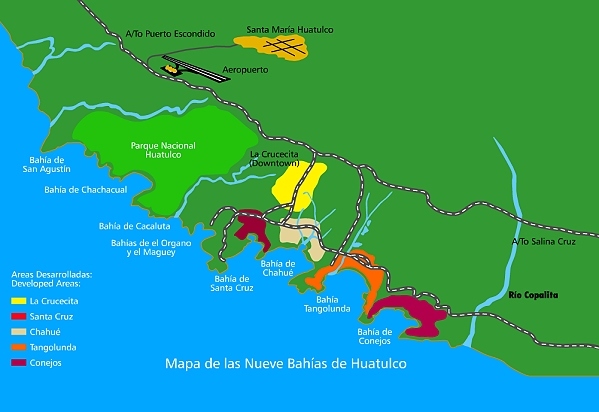 Most of Huatulco’s nine bays were linked by paved road by 1987 (see map). Fonatur took a number of steps to help the original residents adapt to the massive changes taking place around them. It built schools, held public meetings, provided medical and police services, and offered job training programs. Most people gradually adapted; some are employed in Huatulco hotels and some started their own small businesses. By 1994 Huatulco had 1905 hotel rooms and attracted 170,000 tourists, 26% of them foreign. The average length of stay was 4.22 days. Huatulco’s growth has not been as rapid as Cancún’s. By 2006, Huatulco had 2506 rooms and played host to 312,000 tourists (15% foreign). While Cancún first attracted Mexican tourists and then foreign tourists followed (and now dominate), in Huatulco the proportion of foreign tourists has fallen as the resort has developed. The master plan for Huatulco foresees 30,000 hotel rooms and a city with an eventual population of 600,000. As for most of its other developments, Fonatur’s construction of La Crucecita established a clear spatial and visual divide between the tourist areas on the coast and the residential areas for tourism employees, in this case on the inland side of some low hills. Avid Geo-Mexico readers will know that we included a few paragraphs about the Happy Planet Index in our 2010 book, which we later quoted in this 2013 post, Mexico and the Happy Planet Index. The latest (2016) Happy Planet Index (HPI), which uses slightly modified criteria, shows that Mexico has risen to 2nd place in the world rankings, behind Costa Rica, but ahead of Colombia, Vanuatu and Vietnam and well ahead of the U.S. (#108) and Canada (#85). The HPI looked at data for 140 countries. For life expectancy, Mexico ranked #39, for well being #11, for ecological footprint #77 and for inequality #60. Global pattern of ecological footprint. Source: HPI report, 2016. 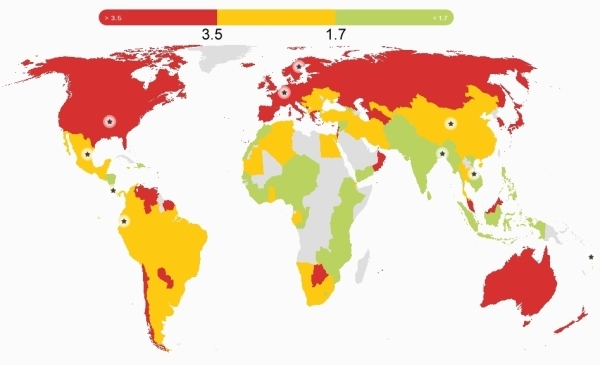 The world map for ecological footprint shows the global pattern. The colors show three categories for ecological footprints, those below 1.7, those between 1.7 and 3.5 and those that exceed 3.5, where the numbers are global hectares (gha) per person. What’s working well in Mexico? In recent years, massive steps have been taken to improve the health of the population of Mexico – notably achieving universal health coverage in 2012, making essential health services available to the entire population. In 2014, a tax was imposed on sugary drinks with the express aim of tackling of obesity – this despite strong corporate opposition. The tax had already led to a 12% decrease in the consumption of such drinks by the end of the year. Environmental sustainability is receiving growing political attention, and was included as one of five key pillars in Mexico’s National Development Plan for 2007–12. Mexico was the second country in the world to incorporate long-term climate targets into national legislation, and is taking important steps to conserve its forests and protect its rich biodiversity. Significant challenges remain for Mexico: economic inequality is a massive problem with a considerable gap between the richest and poorest – the top 20% of the population earns more than thirteen times as much as the bottom 20% of the population. Mexico’s poverty rates are particularly high among indigenous people. Amnesty International has highlighted Mexico’s human rights violations, especially relating to irregular migrants. On top of these issues, the importance of the oil industry to Mexico’s economy complicates its environmental efforts. Mexico recently reached cross-party agreement on the Pacto por Mexico, a pact of 95 initiatives aiming to tackle some of these issues – an important step for the country’s future. The HPI attempts to quantify an alternative vision of progress where people strive for happy and healthy lives alongside ecological efficiency in how they use resources. Mexico may have a high happiness index, but (like the rest of the world) it still has an awful long way to go to ensure a sustainable future for our grandchildren. At the Mexico-China Forum for Cooperation in Mexico City in May 2016, authorities from China’s Guangdong Province met with Mexican officials and discussed plans to invest in Mexico’s recently-established Special Economic Zones. 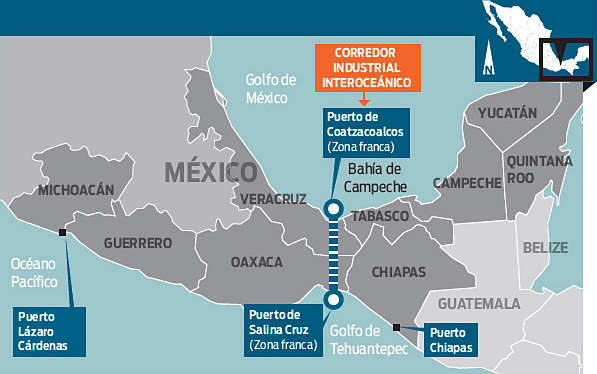 These zones offer tax benefits and support services to investors in order to generate new sources of employment in southern Mexico (Guerrero, Oaxaca, Chiapas, Michoacán, Veracruz and Tabasco). Trade between Guangdong Province and Mexico was worth $10.4 billion last year, 25% of the two countries’ total trade. Chinese firms are considering projects related to aerospace, vehicles, electronics and energy, which could add $480 million in foreign direct investment. In support of closer ties between Mexico and China, China Southern Airlines plans direct flights between Guangdong and Mexico starting next year, which would serve business travelers and also boost tourism. Mexico's geography in the Press Comments Off on Mexico’s tourism development policies: a model for the world? Mexico welcomed a record number of tourist last year: 29.1 million visitors, a 20.5% increase over 2013. The number of tourists is projected to grow 8% this year. Most tourists visiting Mexico come from the U.S., followed by Canada, U.K., Colombia and Brazil. During the first six months of 2015, the average expenditure/tourist was 865 dollars. Mexico is the top international destination for U.S. tourists and according to U.S. Commerce Department data, visits to Mexico by U.S. tourists rose 24% in 2014 to a record 25.9 million, despite U.S. travel warnings relating to parts of the country. Figures from the Mexican side of the border suggest a more modest, though still substantial, increase of 11.8% in U.S. tourists entering the country. The differences in the figures reflect slight differences in definitions and methodology. Just how did Mexico achieve its tourism success? The answer appears to be a combination of its fortuitous proximity to the USA allied with some smart policy decisions. This helps to explain why the Organisation for Economic Cooperation and Development (OECD) has chosen Mexico as the basis for developing a transferable model to demonstrate the potential of tourism in international development. The in-depth study, to be published next year, will focus on the economic and political aspects of international tourism. If you really want to learn more about Mexico’s economy and have a few hours to spare, then the free, open, online video course entitled Mexico’s Economy: Current Prospects and History by MRUniversity is the place to go. The lead instructor is Dr. Robin Grier of the University of Oklahoma. In a series of 51 short videos, she provides an outstanding analysis of Mexico’s economic history and current economic issues. Is Mexico the most dynamic economy in Latin America? After some tough times in the 1980s and 90s, Mexico has emerged as one of the economic leaders of the region. Where does it stand among other emerging markets and what are its prospects for the future? In this four-week course, we will study the modern Mexican economy, some of the unique elements of development in a one-party, authoritarian regime, and some of the challenges the country faced in getting to this point. No prior knowledge of economics (or of Mexico’s geography) is needed to follow the clear and concise min-lectures given by Dr. Grier, though many of her main lines of inquiry will be more than familiar to readers of Geo-Mexico. The course is an outstanding resource for teachers and students of geography and economics, and worthy of wide use in a range of high-school A-level and IB courses as well as college and university programs. Which states are growing fastest? Which of Mexico’s states have the fastest growing economies? 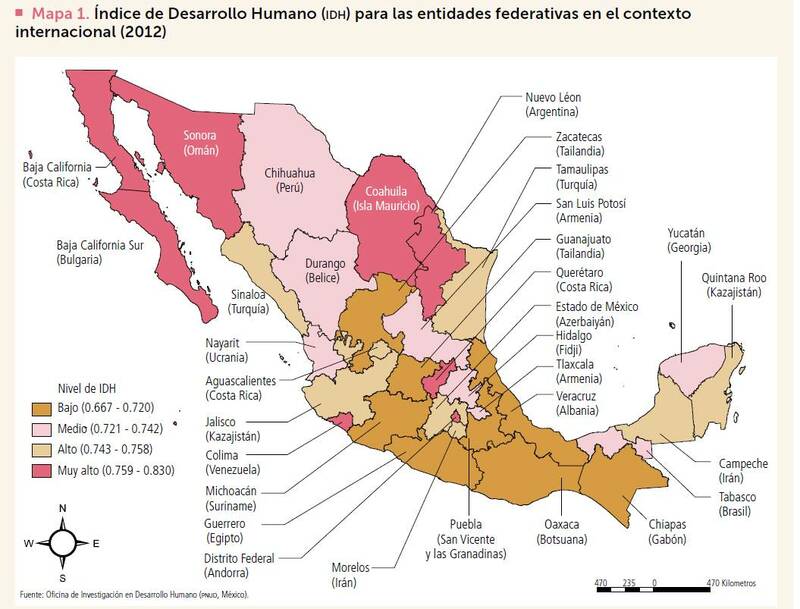 The map below, based on INEGI data, shows each state’s percentage change in GDP for the three year period from 31 March 2011 to 31 March 2014. Only one state – Campeche – registered “negative growth” over the period. In Campeche, production from the oil fields that have long been a mainstay of the local economy has been gradually declining. Besides Campeche, six states grew far slower than the average for Mexico: Durango, Veracruz, Tabasco, Chiapas and Guerrero. Not entirely coincidentally, several of these states are among the poorest in the nation, so their failure to grow as quickly as the average leaves them further behind, increasing the economic inequalities that plague Mexico’s development. At the other end of the spectrum, the economic growth of six states – Sonora, Chihuahua, Aguascalientes, Guanajuato, Michoacán and Querétaro – easily outpaced the average for the country. Sonora, Chihuahua, Guanjuato, Querétaro, and to a lesser extent Aguascalientes, all benefited from foreign direct investments and new industries, such as those involved in the vehicle manufacturing and aeronautical sectors. The case of Michoacán is something of an anomaly, since that state’s economy is still heavily dependent on primary products such as avocados and iron ore. The positive growth in that state may prove to be mainly due to its negative growth in the preceding three years (2008-2011), which meant that it started the three year period shown on the map at an unusually low level. Perhaps more importantly, given the state’s recent political upheavals and gang-related violence, it is highly unlikely that Michoacán will continue to grow anywhere as quickly over the next three years. Mexico is well on its way to meeting most of the eight goals, according to the technical committee established to monitor the country’s progress. The technical committee includes representatives from various government departments, as well as INEGI (the National Geography and Statistics Institute) and CONAPO (the National Population Council). The committee reports that Mexico has already met the targets for 38 (74.5%) of the 51 quantitative indicators used to assess progress towards the 8 goals, and is continuing work towards meeting the remaining targets by 2015 (the deadline for the Millennium Development Goals). Satisfactory or good progress is being made on 5 of the remaining 13 indicators; all five are expected to be met sometime in 2015. Progress on the other 8 indicators has been slower than needed, and it now seems highly unlikely that goal 7 (environmental sustainability) can possibly be met. Other Comments Off on Are Aztec chinampas a good model for food production and agro-development? polyculture, recognizing that this minimized the risks inherent in monoculture. the terracing of steep slopes to channel water where it was most needed. In addition, some indigenous groups, including the Aztec in central Mexico, took advantage of their expertise in water management to develop highly productive systems of farming in wetlands. The chinampas (or so-called ‘floating gardens’) in the Valley of Mexico are the prime example of this water management skill, though similar systems were also used in the coastal marshes along the Gulf coast. On the other hand, the later introduction of large-scale commercial farming methods has often led to deleterious impacts on the countryside and the long term sustainability of such methods is questionable. In seeking to help Mexico’s rural areas, some development experts have suggested re-adopting Aztec methods, especially their method of building chinampas to farm wetlands. The invention of chinampas as a highly productive form of intensive wetland cultivation was, historically, one of the greatest ever agricultural advances in the Americas. Among other things, it allowed settlements to thrive in areas where rain (and therefore rain-fed food production) was markedly seasonal. Among attempts to re-introduce ancient methods, one which stands out occurred in the 1970s and 1980s, when INIREB (Instituto Nacional de Investigaciones sobre Recursos Bióticos), based in Xalapa (Veracruz) employed chinamperos from the Valley of Mexico to build experimental chinampa-like fields in Veracruz and Tabasco . These projects are briefly described in Andrew Sluyter’s fascinating book Colonialism and Landscape, Postcolonial theory and applications (Rowman and Littlefield, 2002), the main basis for this summary. The most ambitious project was a later federally-organized one in Tabasco, where 65 massive platforms (camellones), each about 30 meters wide and from 100 to 300 meters long, were built in the swampy Chontalpa wetlands. The project, known as camellones chontales was backed by the local Chontal community though it was not directly involved in the construction phase. Because of the scale of the project, large mechanical dredgers were used to build the platforms, rather than relying on laborious and slower hand labor. After construction, the Chontal community began farming the platforms, but initial results were very disappointing. Things improved with time, especially when the Chontal took full control of the project. From their perspective, the project meant that more members of the community now had land that could be farmed, and they shifted the emphasis away from the “vegetable market production” favored by officials towards growing corn (maize), beans and bananas for local household consumption, improving local food availability. Recent press reports, such as this 2-minute Youtube clip (Spanish), claim that many parts of the camellones chantales have now been abandoned, owing to insufficient investment in maintenance. Why did the project fail initially? This is one of the key questions connected to this example. Sluyter refers to two articles written by Mac Chapin (from Cultural Survival, an organization that champions the rights of native peoples). Chapin argues that the projects, and their assumptions, were fundamentally flawed. For example, the use of dredges to construct the platforms turned the soil profile upside down, bringing infertile clay towards the top and sending nutrient-rich layers downwards, beneath the reach of plant roots. In turn, this meant that organic matter and fertilizers had to be added to the land in order for good crop yields. Because of the dredging, the canal floor between the platforms was very irregular, making it much more difficult for the Chontal to fish using drag nets. Many of the crops planted were “exotic” and production was market-oriented rather than subsistence or locally-oriented. Chapin was particularly critical of the lack of suitable transport routes for sending produce to distant markets. In addition, chemicals were needed because of the proliferation of insects in these lowland wetlands. (Insects are rarely a problem at the higher altitudes of central Mexico). Chapin concluded that this development project was just one more in a long line of failures where an outside model was introduced into a new area without sufficient prior research or local involvement in the planning stages. 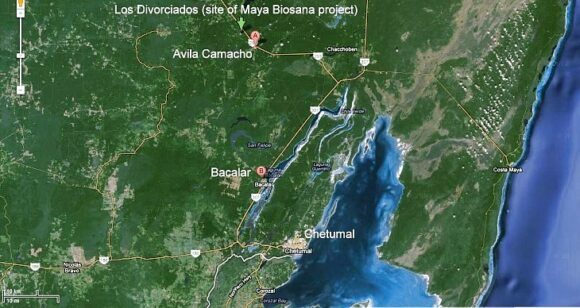 Sluyter agrees with this conclusion, pointing out that there is no evidence that these Tabasco wetlands ever had any form of chinampa farming, even in pre-Columbian times, perhaps because they have “a much greater annual fluctuation in water level than those in Campeche and Veracruz”. Antecedentes de los proyectos de construcción de chinampas en el trópico (1975-1976) – Written by Dr. Arturo Gómez-Pompa, the Director of INIREB when the experimental chinampas were planned and built. Includes a link to a lively exchange of views (in English) about the merits of Chapin’s arguments.